Time of Trouble, A new opera by Canadian composer Elizabeth Raum and librettist Rex Deverell will be given its first fully staged production with orchestral ensemble Thursday, December 15, 8:00 p.m., and Friday, December 16, at 2:00 p.m , in the Sir James Dunn Theatre, Dalhousie Arts Centre. This opera is one of the very few Canadian musical works dealing with an important part of Nova Scotia’s history. 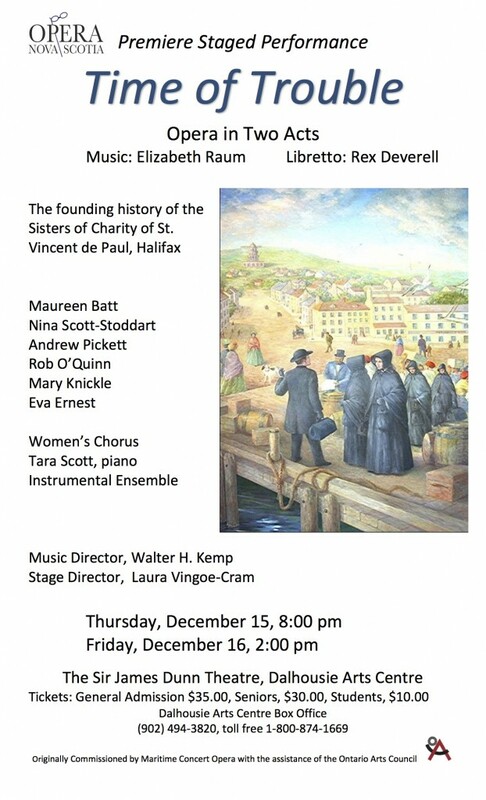 It traces the founding and development of the Sisters of Charity-Halifax, from the arrival of the four original sisters from New York at Halifax Pier in 1849, until the granting of Papal jurisdiction by Pope Leo XIII, 1880. Dramatic focus is set upon the contrasting attitudes to the sisters by the successive Archbishops of Halifax, Connolly and Hannan, singling out the self-sacrificing vison and fortitude of Mother Mary Francis which would subsequently create Mount Saint Vincent University. The Opera Nova Scotia presentation features a strong cast featuring some of the best of Nova Scotia’s vocal talent: soprano Maureen Batt, alto Nina Scott-Stoddart, counter-tenor Andrew Pickett, and baritone Rob O’Quinn. Walter H. Kemp leads a chorus of nine women’s voices and a professional orchestral quintet with pianist Tara Scott. Director is Laura Vingoe-Cram, who has returned to Halifax having obtained her Masters degree in directing from the Royal Conservatory of Performing Arts, Glasgow, Scotland. The production team o headed up by scenographer Katrin Whitehead, costumes director Marilyn McLaren and lighting designer Matthew Downey. Composer Elizabeth Raum has close ties with Halifax, having been Principal Oboe with the Atlantic Symphony Orchestra, and a recipient of an Honorary Doctorate from Mount Saint Vincent University. Rex Deverell, together with his wife Ray, are closely associated with Mount Saint Vincent’s academic life. General $35.00, Seniors $30.00, Students $10.00. For more information call 425-8586, or 852-5170.